Sydney's late ‘90s pub renovation trend of chrome and schmiddys was an aesthetic disaster from which the city has taken a long time to recover. Thankfully, more recent transformations have a little more class, prioritising personality, history and style over homogeny. 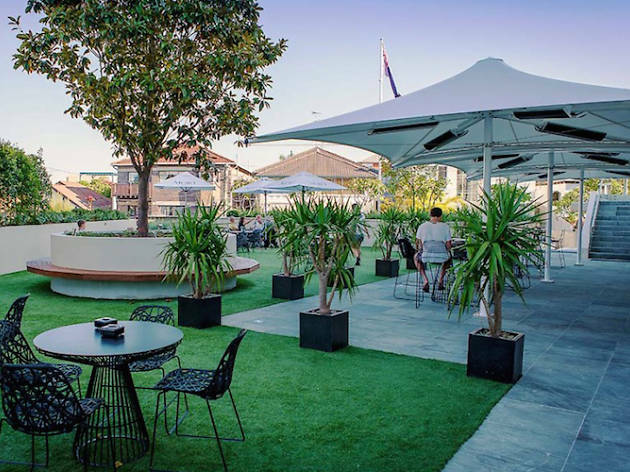 The Clovelly Hotel is one that has looked to its past to move forward, taking the building's Art Deco aesthetic and keeping that theme running throughout the pub. It's seen in the beautiful lighting above the Lounge Bar, and the geometric blue colour palate echoed in most of the pub’s many spaces. To feel like you're near the ocean, take the stairs to the second level. Its elegant metal frame tables and stools spill out to an adjacent beer garden with views (of sorts) out to sea. It's a good spot to observe the handsome building, complete with beautiful timber arch-shaped windows reminiscent of Play School. The drinks are fairly standard – this is more a Tooheys New kind of place than a spot for coastal craft beers – and the wine list mainly local. The Public Bar offers plenty of TAB and betting options, if that’s your thing, and is always full of codgers. 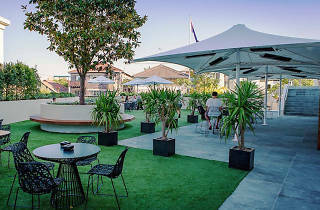 While the Cloey (as the locals call it) no longer feels like the sort of place you can turn up to in a pair of shorts you’ve pulled on after a swim, it's still a decent beachside pub where you can meet a couple friends, order a snack from the bistro and drink a few well-earned arvo beers.